Roasted vegetable recipes are so easy to prepare they make dinner a breeze. Just pop them in the oven next to a main course and go off to do something else while dinner bakes away. Cut parsnips and carrots on the diagonal into 1/4 inch slices. Cut potato and sweet potato into 1/4 inch slices. Cut squash or turnip into 1/2 inch slices. Place all vegetables and garlic in a large roasting pan. Add olive oil. Season with salt and pepper. Toss well. Cover with a lid or foil. Bake 30 minutes. Uncover and bake, stirring occasionally, for an other 30 to 40 minutes or until vegetables are tender, golden brown and still slightly crispy. This oven roasted vegetable recipes are very healthy recipes and provide another interesting way to add a wide variety of vegetables in your menu. I roast vegetables like this a LOT, especially during the colder winter months. It’s a great tummy warmer and perfect when root vegetables are at their peak. 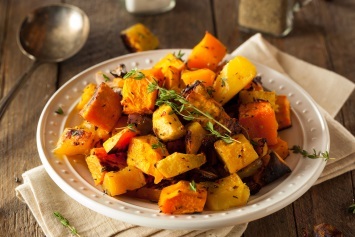 If you like these roasted vegetable recipes, have a look at our other easy dinner recipes. I add broccoli, cauliflower and asparagus with all of the above mentioned veggies. Also I believe it is important to towel dry the veggies before placing on baking sheet. Toss with olive oil, sea salt, pepper, thyme, rosemary and granulated garlic. I find they only need about 20-25 minutes at 400 degrees turning once or twice during that time. Leaving them uncovered allows them to roast and become browned staying firm not soggy. Place all cleaned and cut vegetables in a large baking dish (with parshment paper) all layer not on top of each other add the chicken , you can also add B.B.Q no salt spice or vegetable rosted garlic no salt spice on chicken.cook for about 20 min , add steak in the middle of plate and garlic, all separated nothing should be on top of each other. Season with salt, pepper and fresh herb. Bake, uncovered for about 45 minutes or until vegetables are tender and potatoes are crispy and gold.Look often because the oven is high.